A friend called me up on the phone to ask if I had a passport. I replied that I did not. “Go get one NOW and get it expedited if you have to”, he said. “British Airways just started service from Denver to London and they have a crazy introductory fare of $300.” This friend, we’ll call European Bob, was living and working in the London area at that time and he would be there for another couple of months before he had to return to the United States. I was faced with a pivotal opportunity to hop on the adventure train with a passport, or let it pass by and wonder what could have been. An offer of a free place to stay, incredibly low travel cost and my first international trip outside of North America was too much temptation so I grabbed it. The first moment I could I went to the post office branch that housed a passport acceptance office and got the forms. I then went to go get the mysterious passport photo taken and developed (yes, film). I turned in the filled out form, photos and the extra fee for expedited service to our federal government, crossing my fingers that I would get it all back in time for the flight I had booked in about 6 weeks. At that time, passports were not required for US citizens traveling to Canada or Mexico, so most people, including me, never bothered to get one. Travel outside North America was always a someday thing for me, and I really didn’t know much about how to get a passport. Even now only about one third of US citizens have passports, but travel to exotic places outside of the US is something that most people have on their list of things to do in their lifetime. Since a passport lasts for 10 years before it has to be renewed and you now have to have it even if you are driving over the border to Canada or Mexico, why not get one? The renewal process is easy once you have one and it could be the one thing that changes your life and opens your eyes to the possibility of seeing the world. Get the application form online or at a passport acceptance location. These are in certain post offices, some title bureaus, and sometimes even certain libraries. Fill it out but do not sign it until you are in front of the passport acceptance agent. Get your documentation prepared that proves you are a US citizen. You will need a certified birth certificate with an embossed seal or a naturalization certificate. You also need your current ID like a state issued driver’s license, a government ID card, or military ID. Have photocopies front and back of both your proof of citizenship and your ID along with the originals. Go get your passport photo taken by a professional photographer or a place that specifically advertises passport photos. DO NOT try to take your own photo or use something from your Facebook account. The specifications are an international standard, and you must have two that are exactly the same and be an exact height, and width. If your photos are not to these specifications your application will be rejected. Any place that advertises that they sell passport photos will get you what you need. Next, show up in person with your application, documentation, fee and photos. Verify ahead of time by phone the hours for your location. Hand it all over and wait about 6 weeks. If you have never had a passport before you must show up in person to a Passport acceptance location. Smile and be nice to the people there – yes it’s a government thing and they might not use the same smiley customer service skills as the Disney Store at the mall, get over it. When you get your passport back check it carefully to make sure everything is correct. You don’t want any uncomfortable discussions with border guards Mr. Anderson… if that is indeed your real name. Your passport will expire 10 years from the date it was issued, so now you are ready to go on that trip you have always dreamed of. In fact, I would say don’t think of it as your trip of a lifetime, but as a lifetime of trips! You can use your passport as identification on domestic flights too and nobody will look at you funny, except maybe those people who don’t yet have a passport. They might think your some kind of dignitary and want their picture taken with you because you must be famous. * You can smile for the camera and then politely explain that you decided to get your passport to take a trip to Tahiti and it was so easy they can get one too! 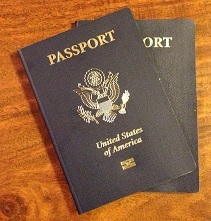 Passports are still one of those paper documents recognized and used around the world. The stamps in and out of different countries still get pounded out in the back pages by border crossing guards showing the date and location like some kind of official souvenir autograph book. Safeguard it as you would your valuables. This is your ticket into exotic destinations but also your ticket back into your own country. Sometimes it feels like getting back into the US is scarier than going into a foreign country. (What if they decide I’m not cool enough to let back in?) If you do happen to lose your passport while traveling abroad, report it to the local authorities immediately and contact your nearest embassy office. It’s also a good idea to travel with photocopies of your passport carried separately. The photocopy won’t work at a border crossing, but it might be helpful to the embassy officials to show that you did have the passport in the first place. Don’t forget to renew your passport before it expires. I woke up in a cold sweat the other night thinking that I forgot to renew mine, so I had to get up right then and check that it was still valid before I could fall back asleep. The renewal process is a little bit easier since you don’t have to show up in person. Instead of the birth certificate, you just send in your old passport with a new application and photos. You should get your old one returned to you but in case it gets lost you want to remember all of those stamps you collected in your ten years traveling to Europe, South America, Australia, and Southeast Asia. Be sure to scan the stamps to a digital file so you can remember them. More Americans have a passport now than ever before but the percentage of the population with a passport is relatively low compared with other countries. Depending on how you crunch the numbers it’s between 35%-39%. Cost, coupled with the inconvenience of the process may hold people back. Plus, a lot of people think that international travel is out of their reach, but like anything else, if you want it bad enough you can find a way to do it. If you dream of one day going to visit the country of your ancestors, or even want to go on that fishing trip to Canada get the passport now and you won’t have to worry about it later. So go now, fill out the form and get your passport even if you don’t have a trip planned. That call I got out of the blue asking if I had a passport changed my life, and it really started an adventure. The US Department of State website has all of the official forms, fee schedules, and locations for passport acceptance offices.